Mountainbrook Village is a 55+ community in Gold Canyon, Arizona. 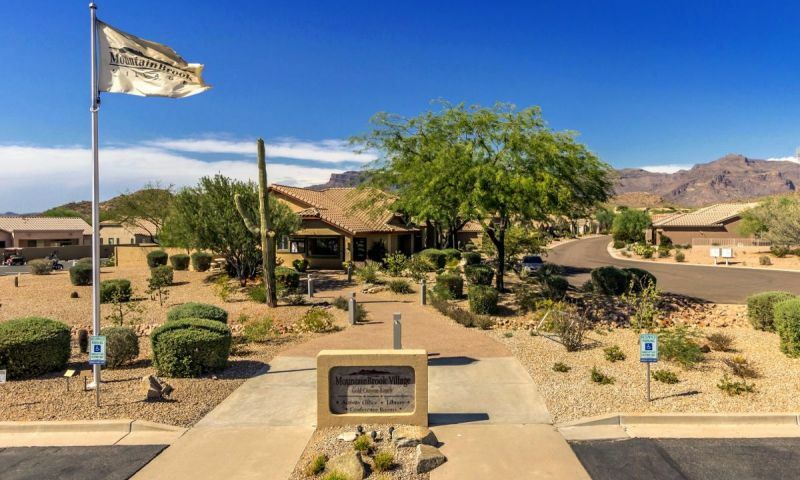 Based at the bottom of the Superstition Mountains, this active adult community in the Phoenix area enjoys gorgeous views and spectacular outdoor recreation opportunities. Mountianbrook Village has low-maintenance attached and single-family homes available on a resale basis. Residents of this active adult community enjoy a laidback lifestyle without having to worry about lawn care of exterior home maintenance. Owning a home inside of Mountainbrook Village means having time to spend with family and friends. With resort-style amenities, a convenient location, and mild climate, it's easy to see why Mountainbrook Village is popular community in Central Arizona. Residents of this 1,659-home community enjoy an amenity complex that includes a fitness center, two outdoor pools, hobby rooms, computer lab, library, billiards and ballroom. Outside there are tennis, pickleball and bocce ball courts. There are two semi-private 18-hole championship golf courses in the community including Mountainbrook Village Golf Course and Gold Canyon Resort. The courses feature true rolling greens, generous fairways, sparkling lakes and crystal white sandtraps. Mountainbrook Village sold out of new construction homes built by Shea Homes and UDC in 2001 but a consistently changing lineup of resale homes are continually available. Homebuyers can select from single-family and duplex homes that range from 1,332 to over 2,400 square feet. The duplex homes range from 1,393 to 1,526 square feet in size. These homes offer two bedrooms, two bathrooms, and an attached garage. The single-family were built with two to four bedrooms, two to three bathrooms, and an attached two-car garage within 1,581 to 2,491 square feet of living space. Many of the homes in Mountainbrook Village offer picturesque views of the golf courses and nearby Superstition Mountains. A diverse mix of residents contribute to a socially and physically active lifestyle. Everyday in Mountainbrook Village there is a generous assortment of activities, events and club meetings. There are over 50 clubs and activities that are organized by the community's activities director. Art groups like ceramics, oil painting, crafts, watercolor, and stained glass are great for the creative types. Sport and game activities include bocce ball, bunco, darts, chess, bowing, softball, tennis, water volley and more. Getting to know your neighbors and making lifelong friends is easy with many social groups like California club and political groups. Residents of this area enjoy the quiet solitude just beyond the suburban sprawl of Phoenix. Ask a Mountainbrook Village resident about their community and you will likely hear something about the mystique of Gold Canyon. Outdoor enthusiasts revel at the proximity to the towering peaks and nearby attractions such as Lost Dutchmen's State Park and Canyon Lake. Residents boast that there is something inexplicably unique about their community 42 miles east of Phoenix. The community is described as small and remote yet still close to everything. Mountainbrook Village is located just beyond the Superstition Freeway east of Apache Junction. Although the community is somewhat isolated, nearby attractions in Mesa, Gilbert and Chandler are a quick 20 to 30 minute drive. Fitness Center - 1,900 Sq. Ft. There are plenty of activities available in Mountainbrook Village. Here is a sample of some of the clubs, activities and classes offered here. There is a sections of attached homes that were built by UDC known as the Pinncale Vistas. There are two models offered in this collection that range in size from 1,393 to 1,526 square feet. Homes feature two bedrooms, two bathrooms and a two-car garage. All casitas back up to a golf course or natural desert view. There are five models that were built by UDC that range in size from 1,581 to 2,310 square feet. Homes feature two to three bedrooms, two bathrooms and a two-car garage. There are three models in the Village Series that were built by Shea Homes. These homes range in size from 1,332 to 1,411 square feet and feature two bedrooms, two bathrooms, and a two-car garage. The Heritage Series built by Shea Homes offered five models that range in size from 1,410 to 1,842 square feet. Homes feature two to three bedrooms, two bathrooms, and a two-car garage. Shea Homes offered ten models in the Estate Series. Homes range in size from 1,443 to 2,491 square feet and feature two to four bedrooms, two to three bathrooms and a two-car garage. I moved here to get away from the congestion and crowds of Phoenix. The mountain views are outstanding and the golf is great. It's a really friendly community with lots of different clubs to join. Everyone really encouraged me to get involved and I'm glad I did. It's been great meeting new people, joining a golf league and doing some of the game clubs too. I'm glad I finally decided to sell my large home for something smaller and more manageable. Plus the prices are really a good value here too. 55places.com is not affiliated with the developer(s) or homeowners association of Mountainbrook Village. The information you submit is distributed to a 55places.com Partner Agent, who is a licensed real estate agent. The information regarding Mountainbrook Village has not been verified or approved by the developer or homeowners association. Please verify all information prior to purchasing. 55places.com is not responsible for any errors regarding the information displayed on this website.